Advantages: New ordinance is very nicely done. Extra LANTIRN pod. Disadvantages: Still decals for the cockpit. High price. As the United States Navy upgrades its F-14 fleet, Tamiya periodically reissues its venerable old F-14A Tomcat kit with new parts to keep pace with the changes. When first released about 20-odd years ago, the kit represented an early F-14A which was devoid of unsightly ECM bumps and had the original “grill” style gun gas purge vents. In 1994, Tamiya reissued the kit as what they called the “1994 version”. This boxing of the kit added the undernose Television Camera Set (TCS), changed the gun gas vents to the later NACA scoop style, and added the ECM bumps under the wing gloves and on the beavertail. New sprues were added with more detailed Pratt & Whitney exhausts and, in a nod to the aircraft’s emerging air-to-ground role, underfuselage bomb racks and four Mk.82 bombs with Snakeye retarder tails. A disadvantage of the “1994” kit is that the air-to-air weapons were unchanged and included AIM-9Ds as the only Sidewinder version, even though that version of the missile was long out of USN service by 1994. This new release of the kit updates the previous “1994” version with the addition of the LANTIRN targeting pod and the inclusion of Laser Guided Bombs. While Tamiya’s F-14 kit contains some nice detail in areas such as landing gear and the exhaust nozzles, which can be shown either open or closed, the basic kit is an older kit from an era different than the kits we have been used to seeing from Tamiya in the last 10 years or so. Some of the design features in this old kit may come as an unpleasant surprise to modelers expecting a quality lever similar to Tamiya’s excellent F-15 and F-4 series kits. The criticism most often mentioned is the use of decals for the instrument panels and side consoles, which many feel is less than satisfactory for a kit of this size and price. Also, the surface detail is a strange mixture of panel line styles with the forwards fuselage and wings featuring recessed panel line detail and the rear fuselage featuring raised panel line detail. Finally, for those who remember the raised “battle damage repair” patches on Tamiya’s F-4 kits, the trend may have started here with a couple of raised panels on the forward fuselage which gives the appearance of appliqué armor. Unfortunately, these areas are unchanged in this release of the kit. 2x ADU-703/BRU-32 bomb pylons with separate sway braces. The kit also includes a couple of new parts mixed in with the old sprues. Specifically, a new port nosewheel door with a base for the new antenna bulge and RWR bumps for the forward wing glove leading edge have been added to sprue “A”. 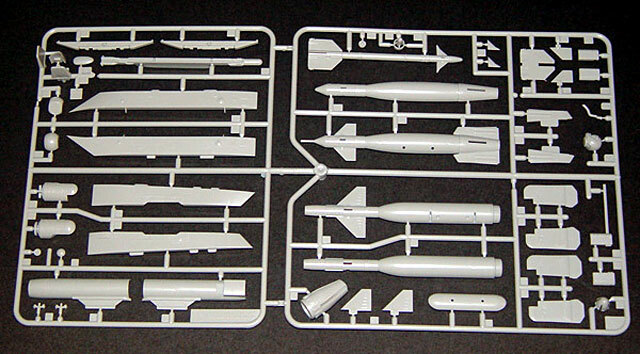 In addition, seekers for the GBU-24s have been added to clear parts sprue “G”. The overall molding quality of the new parts is very good. The new weapons are well done although, like the weapons in the Academy F/A-18C kit, all of the bombs are smooth and lack the rough thermal protection coating of shipboard USN bombs. The LANTIRN pod is broken up into a number of detailed parts including a separate forward section and a separate seeker head, similar to the breakdown in the Hasegawa 1/48 Weapons set “D”. Although this parts breakdown could, in theory, allow the forward section and head to rotate, the parts have tabs that fix them in place to show the seeker in the normal stowed position. A little surprisingly, the optic windows are just recessed shapes and no clear parts are provided, although this isn’t a big problem with the seeker head in the stowed position as most of the windows are covered anyway. Phoenix adapter pylons as included to go underneath the wing glove pylons allowing, for the first time on the kit, to add the AIM-54s underwing. This is a welcome addition is it is not uncommon to see current F-14s carrying only a single Phoenix missile, on the port underwing pylon. A nice result of Tamiya using duplicated sprues is that you get two complete LANTIRN pods and pylons, two underwing Phoenix pylons, and two GPS and nosewheel door antennas. As only one of each is normally carried, the extras can be used to partially upgrade another kit, although you are on your own for the AIM-9L/Ms and BOL rails as the kit only contains enough of these items for one aircraft. One item not updated for this kit is the cockpit, which unfortunately still uses decals for the instrument and console detail. The result is that the kit does not contain the LANTIRN control stick on the port RIO console, and only contains the original round Tactical Information Display (TID) instead of the newer square Programmable Tactical Information Display (PTID). It is a little disappointing that Tamiya didn’t address the cockpit in a kit of this price. Molding a couple of new instrument panels and some side consoles that could be placed on top of the blank consoles of the cockpit tub seems a simple solution that would have greatly enhanced the kit. Those who want to do something about the cockpit are forced into buying an aftermarket set, of which the Teknics set is the only one currently available. For this kit, my recommendation is to buy the F-14B cockpit set (TK32012) as this set contains the LANTIRN console and stick, and both the TID and PTID. 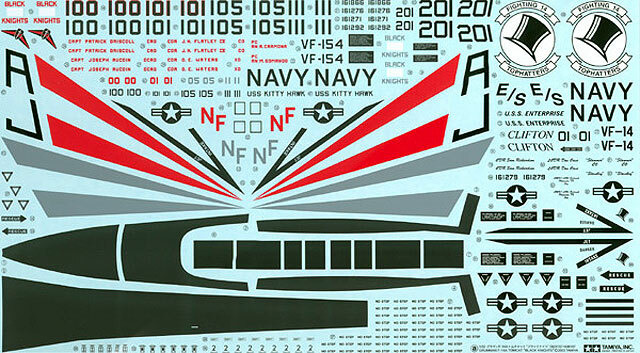 Decals are provided for five aircraft, four from VF-154 “Black Knights” based on the USS Kitty Hawk, and one from VF-14 “Tophatters” from the USS Enterprise. The four VF-154 birds are in FS 36320/36375 with black anti-glare panels and vertical tails. The markings for the four aircraft differ mainly in the Modex and whether the stripes on the tail are in red or gray, with one of the aircraft being the CAG bird. The VF-14 aircraft is in overall FS 36375. The decals are standard Tamiya, crisp, but thick. Stenciling for the weapons and the LANTIRN pod are included on a separate decal sheet. Also included is the sheet of paper remove before flight tags from the “Bunker Buster” release of the F-15E. It is good that Tamiya has modernized their old kit, but the fact remains that the kit is an older kit with the price of a brand new kit. At a US retail of $167, the kit is a few bucks more the “Bunker Buster” F-15E, the latter being a modern tool kit with a detailed cockpit and recessed panel panels lines throughout. 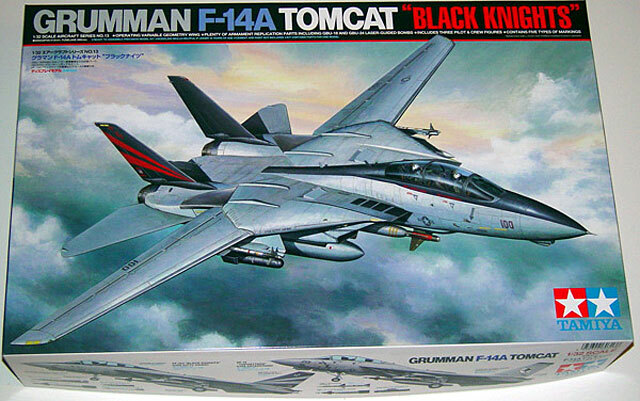 The Tamiya Tomcat is also more expensive than the new Academy Hornet kit which is arguably more detailed and contains many more parts. One is almost obligated to buy the Teknics cockpit, which adds another $48 to the price one must pay to get a detailed large scale F-14 kit, resulting in a total price of over $200 if full retail price is paid. There aren’t a lot of alternatives, with the Revell F-14A being the only other available kit in 1/32 scale. Although the Revell kit is less detailed overall, it does have a cockpit with raised detail and is considerably cheaper than the Tamiya kit. Given that the Tomcat is being replaced by the F/A-18 and is expected to be phased out by 2007, the prospect of a major manufacturer making a new tool Tomcat is probably not in the cards, although I’d love to be proven wrong on this. Sample kit courtesy of my ever dwindling bank account.